Download "University of Birmingham. Closed Circuit Television (CCTV) Code of Practice"
1 University of Birmingham Closed Circuit Television (CCTV) Code of Practice University of Birmingham uses closed circuit television (CCTV) images to provide a safe and secure environment for students, staff and visitors and to protect University property. 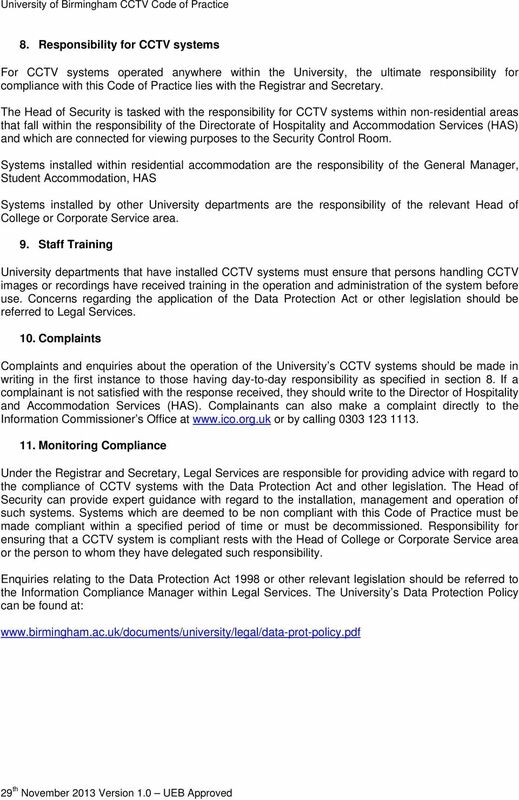 This Code of Practice sets out the accepted use and management of CCTV equipment and images to ensure the University complies with the Data Protection Act 1998, Human Rights Act 1998 and other legislation. Where in this Code of Practice there is reference to the Data Protection Act or other legislation this includes all statutory amendments and subordinate legislation and regulations. 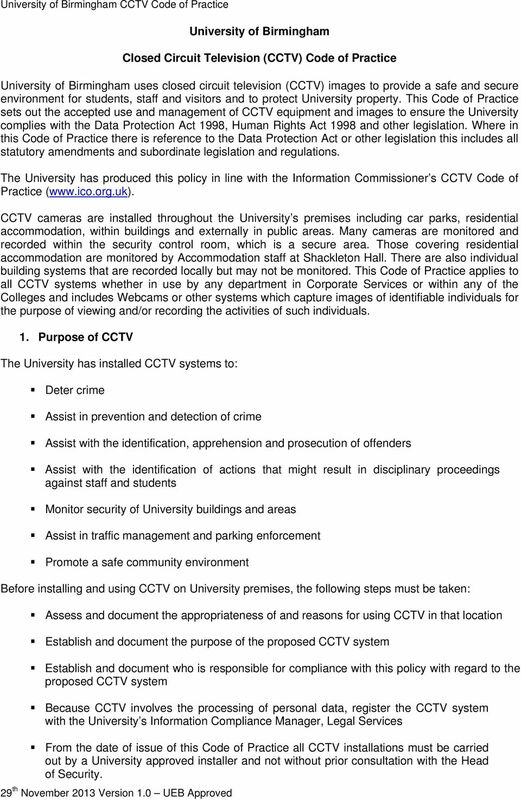 The University has produced this policy in line with the Information Commissioner s CCTV Code of Practice ( CCTV cameras are installed throughout the University s premises including car parks, residential accommodation, within buildings and externally in public areas. Many cameras are monitored and recorded within the security control room, which is a secure area. Those covering residential accommodation are monitored by Accommodation staff at Shackleton Hall. There are also individual building systems that are recorded locally but may not be monitored. This Code of Practice applies to all CCTV systems whether in use by any department in Corporate Services or within any of the Colleges and includes Webcams or other systems which capture images of identifiable individuals for the purpose of viewing and/or recording the activities of such individuals. 1. Purpose of CCTV The University has installed CCTV systems to: Deter crime Assist in prevention and detection of crime Assist with the identification, apprehension and prosecution of offenders Assist with the identification of actions that might result in disciplinary proceedings against staff and students Monitor security of University buildings and areas Assist in traffic management and parking enforcement Promote a safe community environment Before installing and using CCTV on University premises, the following steps must be taken: Assess and document the appropriateness of and reasons for using CCTV in that location Establish and document the purpose of the proposed CCTV system Establish and document who is responsible for compliance with this policy with regard to the proposed CCTV system Because CCTV involves the processing of personal data, register the CCTV system with the University s Information Compliance Manager, Legal Services From the date of issue of this Code of Practice all CCTV installations must be carried out by a University approved installer and not without prior consultation with the Head of Security. 2 2. Cameras The University will make every effort to position cameras so that they only cover University premises as far as possible. No cameras will focus on private residential areas within University accommodation where avoidable, but will focus on public or shared areas. Camera operators who monitor cameras for the purpose of public space surveillance will receive SIA (Security Industry Authority) Licensing. The situation of cameras should ensure that viewing does not intrude into neighbouring domestic areas that border the University s property as far as is practicable. 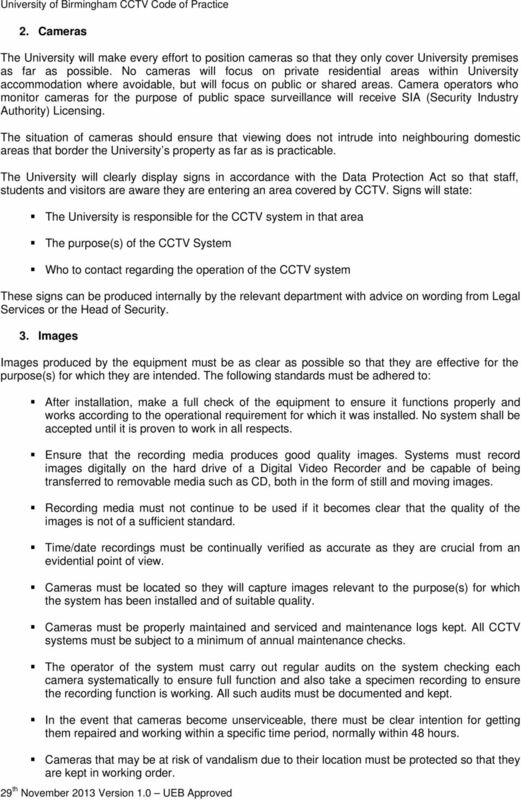 The University will clearly display signs in accordance with the Data Protection Act so that staff, students and visitors are aware they are entering an area covered by CCTV. Signs will state: The University is responsible for the CCTV system in that area The purpose(s) of the CCTV System Who to contact regarding the operation of the CCTV system These signs can be produced internally by the relevant department with advice on wording from Legal Services or the Head of Security. 3. Images Images produced by the equipment must be as clear as possible so that they are effective for the purpose(s) for which they are intended. The following standards must be adhered to: After installation, make a full check of the equipment to ensure it functions properly and works according to the operational requirement for which it was installed. No system shall be accepted until it is proven to work in all respects. Ensure that the recording media produces good quality images. Systems must record images digitally on the hard drive of a Digital Video Recorder and be capable of being transferred to removable media such as CD, both in the form of still and moving images. Recording media must not continue to be used if it becomes clear that the quality of the images is not of a sufficient standard. Time/date recordings must be continually verified as accurate as they are crucial from an evidential point of view. Cameras must be located so they will capture images relevant to the purpose(s) for which the system has been installed and of suitable quality. Cameras must be properly maintained and serviced and maintenance logs kept. All CCTV systems must be subject to a minimum of annual maintenance checks. The operator of the system must carry out regular audits on the system checking each camera systematically to ensure full function and also take a specimen recording to ensure the recording function is working. All such audits must be documented and kept. In the event that cameras become unserviceable, there must be clear intention for getting them repaired and working within a specific time period, normally within 48 hours. Cameras that may be at risk of vandalism due to their location must be protected so that they are kept in working order. 4 The reason for viewing the images The date and time the media were returned to the CCTV system or secure storage Disclosures to third parties will only be made in accordance with the purpose(s) for which the CCTV system is used and will be limited to: Police and other law enforcement agencies Relevant legal representatives as defined by the Civil Procedure Rules Data subjects whose images have been recorded and retained in accordance with section 7 below (unless disclosure to the individual would prejudice criminal enquiries or criminal proceedings) Members of staff authorised to review and retain copies of recorded images as part of the management of internal procedures within the University such as disciplinary procedures Where the disclosure is authorised by law or in compliance with a court order All requests for disclosure must be documented. If disclosure is denied, the reason must also be recorded. In addition to the information required above, the following must also be documented: If the images are being removed from the CCTV system or secure storage to another area, the location to which they are being transferred Any crime incident number, if applicable The signature of the person to whom the images have been transferred on a formal written receipt as acknowledgement of transfer 7. Individual Access Rights by Data Subjects The Data Protection Act gives individuals (data subjects) the right to access personal information about themselves, including CCTV images. 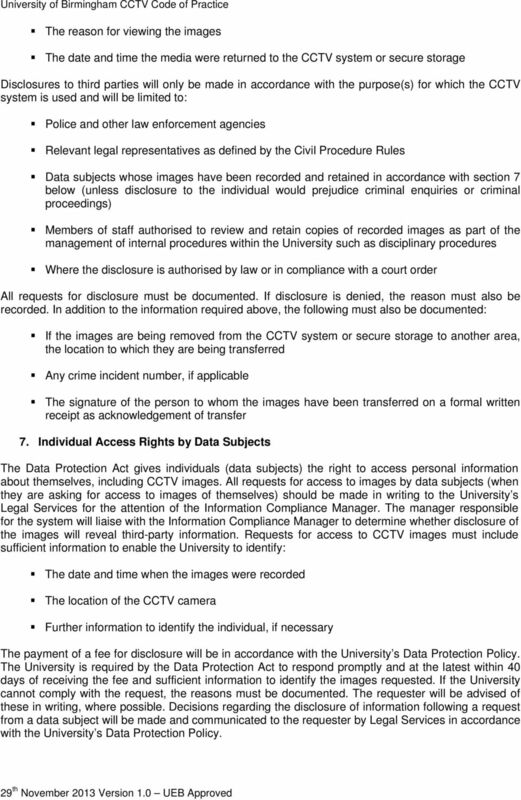 All requests for access to images by data subjects (when they are asking for access to images of themselves) should be made in writing to the University s Legal Services for the attention of the Information Compliance Manager. The manager responsible for the system will liaise with the Information Compliance Manager to determine whether disclosure of the images will reveal third-party information. 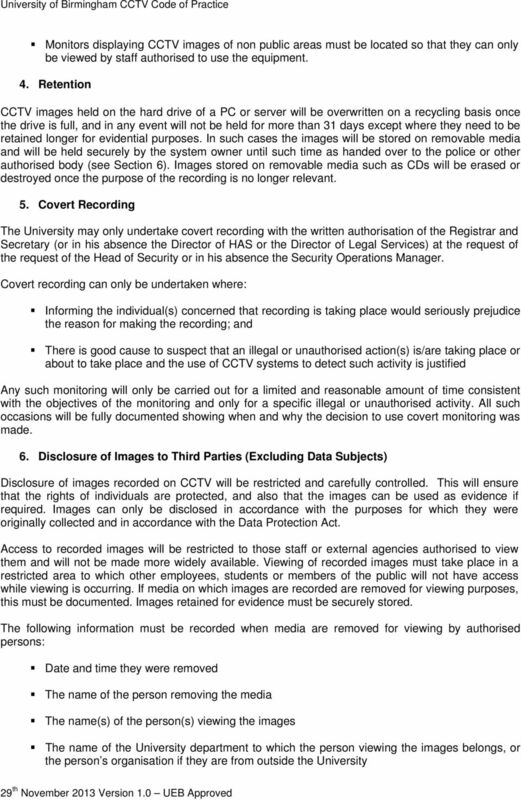 Requests for access to CCTV images must include sufficient information to enable the University to identify: The date and time when the images were recorded The location of the CCTV camera Further information to identify the individual, if necessary The payment of a fee for disclosure will be in accordance with the University s Data Protection Policy. The University is required by the Data Protection Act to respond promptly and at the latest within 40 days of receiving the fee and sufficient information to identify the images requested. If the University cannot comply with the request, the reasons must be documented. The requester will be advised of these in writing, where possible. Decisions regarding the disclosure of information following a request from a data subject will be made and communicated to the requester by Legal Services in accordance with the University s Data Protection Policy. Group TABLE OF CONTENTS 1. Purpose and scope of the video-surveillance policy... 2 2. Respect for privacy, data protection and compliance with the relevant rules... 2 2.1. Compliance status... 2 2.2. This Policy was approved by 2014.